2018 marks our 10th anniversary and we are overflowing with pride and joy over all of our accomplishments! Our theme of the year is the Power of Many because everything we do at Shoresh is done with community members and for community members. Shoresh is truly a collective of diverse people, plants and pollinators working together to build a culture of Shomrei Adamah, protectors of the earth. We created 16 community gardens! From Vaughan to Kensington Market, we’ve established biodiverse gardens throughout the GTA helping to connect pre-schoolers to seniors to the natural world. Some of our sites include the Kavanah Garden, Bernard Betel, Baycrest, 3 backyard gardens, the Wolfond Centre, Maxie’s Garden, Beth David Synagogue and The Kiever Synagogue. 60 students have graduated from the Shoresh Outdoor School! Our after-school program that bridges Jewish learning with hands-on garden and nature-based activities has resulted in 60 future Jewish environmental leaders! We’ve planted 9,000,000 flowers for pollinators! From our 20-acre bee sanctuary at Bela Farm to our pollinator gardens throughout the GTA, we have provided essential, diverse and chemical-free forage for hungry bees and butterflies that call Ontario home. We’ve enabled 40,000 hands to touch the earth! 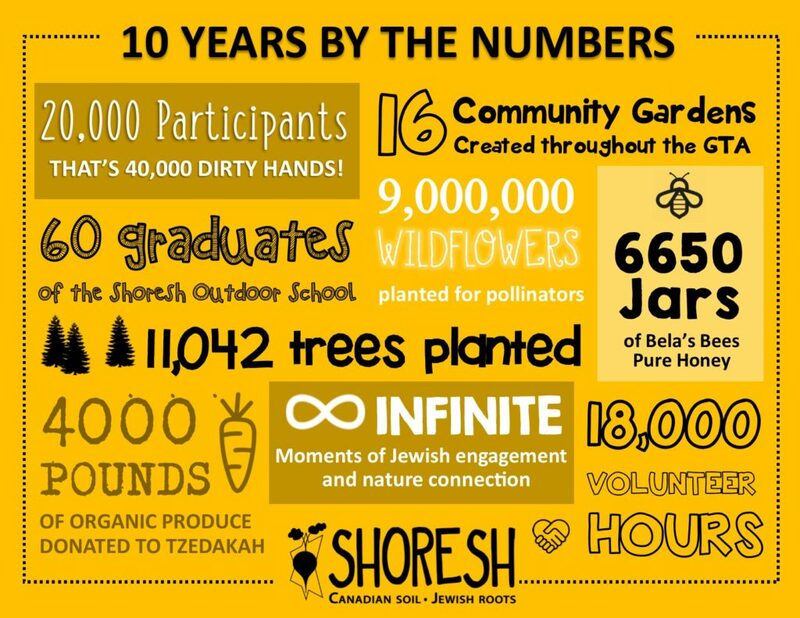 We’ve created opportunities for more than 20,000 community members to deepen their connection to the land through our hands-on, nature-based Jewish educational programs. We’ve reforested more than 20 acres in our Forest For the Future at Bela Farm to capture carbon, create much needed habitat and build a forest for our descendents who will, Gd willing, frolick through a mature forest in 200 years. We’ve donated more than 4000 lbs of community grown, organic produce for vulnerable community members. We grow organic veggies with diverse community members and then donated of our harvest to Ve’Ahavata, Chasdei Kaduri Jewish Food Bank, Jewish Family and Child and the Kehilla Residential Program. In 2013, we fell in love with bees and got three hives at Bela Farm. Now tending to 20 colonies, we love learning and caring for our bees and are so grateful for the sustainable by-product of liquid gold we get to share with you. In 2018, more than 1200 Jewish families across North America enjoyed dipping apples in our honey during Rosh Hashanah. Many hands make for a lighter load! Everything we have done has been done with the power of many hands over many hours. Thank you to our incredible volunteers for building Shoresh! We’ve partnered with more than 70 community organizations! Let’s face it-we’re all in need of more nature connection and our community knows that. That’s why we’ve collaborated, partnered with and ran nature-based Jewish educational programs for more than 70 diverse community organizations. We are better together! We’ve facilitated, enabled and created opportunities for infinite moments of WOW. From hikes to making pickles with seniors, we have supported community members deepen their connection to their Jewish roots in Canadian soil.